Chef Roberto Ruíz of Madrid restaurant Punto MX is currently serving Entomofagia. An insect fine dining menu where insects in various forms integrated into the very DNA of the menu, let’s find out more. Right now Chef Roberto Ruíz of Punto MX in Madrid is serving his Entomofagia menu. It includes dishes like Surf ‘n’ turf Guacamole with smoked marlin and crispy Chinicuilworms. Monkfish with flying ants crushed tableside and Pork Belly with tamarind-glace and chapulin crickets. Not like your average fine dining menu I guess. What Roberto is doing is unique. Sure, there have been various insects served for a while at fine dining restaurants in Europe. I think we’ve all been eating ants at some point the last year or so. 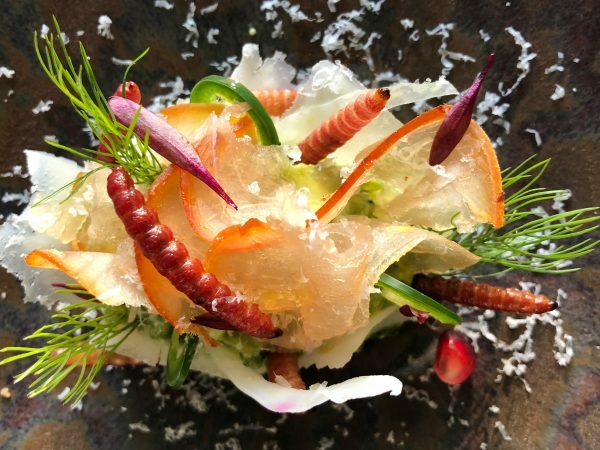 Roberto takes insects to the next level and has created a full insect fine dining menu. Preparing and serving insects have been prohibited in Europe up until recently when it got allowed. Roberto has had a dream of incorporating insects on the menu since 2012 and now with the ban lifted he got to create the menu. Up until the ban was lifted he has been working with dishes that in some way includes some of the roughly 500 different species of insects that are consumed in Roberto’s home country Mexico. “Entomophagy is about roots. My father is from one of the significant Mexican areas of insects; El Valle de Mezquital in Hidalgo, so insects was a big part of my childhood. It’s my personal taste, it’s protein contribution, it’s unique to the world and the reason why we brought it to Spain.” – Roberto Ruíz. Guacamole with smoked marlin, 36 month-aged Parmesan, avocado, pomegranate, jalapeños and crispy Chinicuil-worms from the agave plant. The menu is not created to generate a buzz or make guests taste their own boundaries. For Roberto its more about help shaping the food of the future. For that reason, the recipes in the menu are not based on traditional Mexican cooking techniques for insects but created from scratch by Roberto, but still keeping flavors Mexican. Even though the idea of the menu is not about creating a wow-factor interest has been massive. 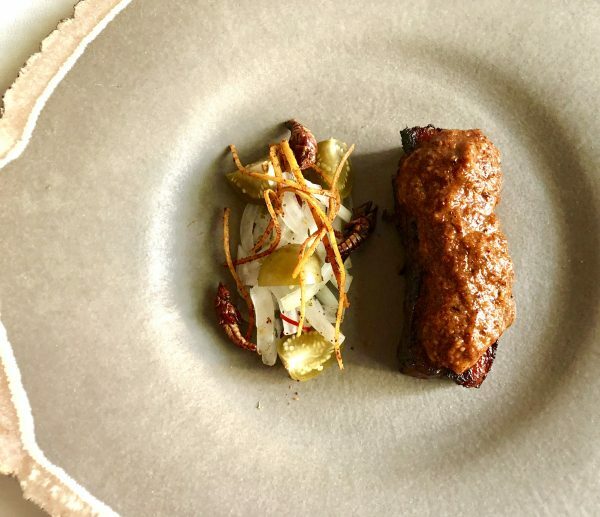 Among the first guests to enjoy the insect fine dining menu was Spanish super-chef Ferran Adria and right now you’ll need to line up to get a seat at Punto MX, a good idea even if you don’t want to try the insect menu, it is optional. Although if you get a seat and truly have an interest in food at the highest level you really should give it a go. Not convinced? Check out a few dishes from the menu below. Let’s look at a few more dishes from this exciting menu. 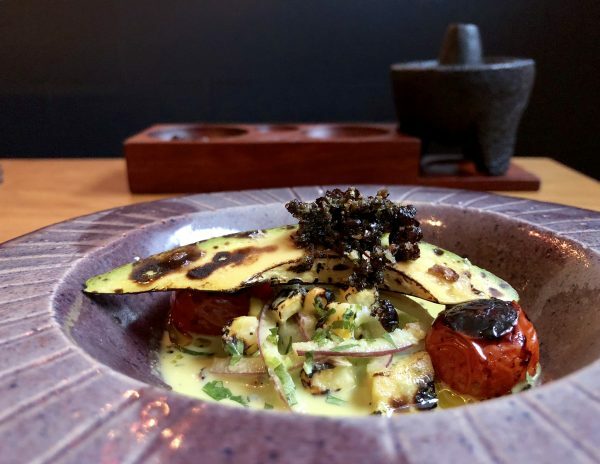 Monkfish Aguachile with vegetables prepared in flames, tomato, avocado and Chicatana; bellies of flying ants crushed tableside. Braised pork belly with Tamarind glace mixed Alfafa-fed Chapulin crickets. Escamoles carefully seared with garlic and chili in bone marrow fat, and arranged in a split bone marrow on top of the soil made by corn and chicatana ants. For even more about Roberto Ruíz, you can read the interview I did with him here at Ateriet. 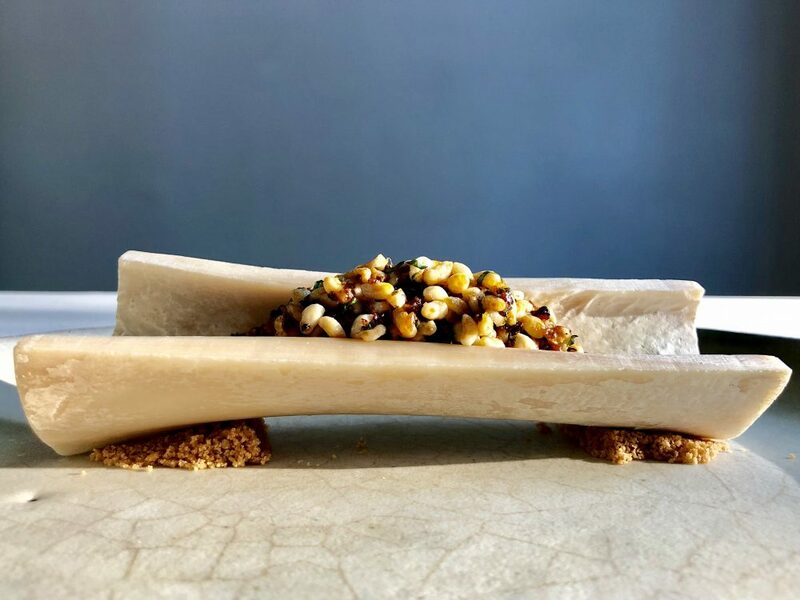 Roberto Ruíz is the first one in Europe to create a full insect fine dining menu but hardly the only one looking at the new protein. For more do check out this great cookbook about eating insects. And how will insects be sold besides at restaurants? I’ve previously looked into how we will package insects and this bread company from Finland actually launched an insect bread, all worth checking out. Roberto Ruíz, a Mexico City-native, defines himself as a chef who’s passionate about what he does, creative, technicist and innovative without ever forgetting tradition. Aside from Punto MX his world also includes Mezcal Lab, a unique concept where to enjoy Punto MX’s most representative dishes of the last six years and new cocktail lines based on Mezcal. Also Salón Cascabel, likewise in Madrid, a contemporary antojería that preserves the handmade nature of traditional cuisine. With unique dishes, it offers the best authentic Mexican flavors with local products of the highest quality. Additionally Cantina y Punto, in Bogotá, a partnership with Takami Group, the supreme most important group of the restaurant and hotel business in the Colombian capital. Here Roberto Ruiz offers a diverse cuisine inspired by the authentic Mexican flavors in an easy-going atmosphere. In December 2017 Roberto Ruíz opened Barra Cascabel in Lisbon in partnership with José Avillez, making its debut in the Gourmet Experience at El Corte Inglés Lisboa. Like Salon Cascabel in Madrid, Barra Cascabel has the setting of a contemporary ‘antojería’; an informal place where the best antojitos and cocktails are to be shared amongst like-minded food lovers. Its gastronomy is easy to understand, close, fun and with a broad spectrum of all tastes. Last but not least, La Huerto de lat Retamilla Ecológico. The impressive 9 hectares biodynamic orchard in Segovia, Spain, where more than 80 different species of Mexican products are grown which makes Ruiz’s places the only 100% self-sufficient Mexican restaurants in Europe.